As attorneys who have dedicated our careers to helping New York citizens avoid the harmful effects of having criminal records, we are used to advising people on the consequences. However, it is one thing to hear from your attorney how important it is to clear your record, but it another thing altogether to see just how a Human Resources Guide specifically instructs employers on how to treat employees with records. Unfortunately, employers are often instructed to require that employees disclose if they have been charged or convicted of a criminal offense. Even if some states have already barred private employers from asking these questions during the employment process and/or otherwise limiting employers from probing into criminal history when it comes to applications. We discuss this in more detail below. Many HR guides also unfairly label employees who have been disciplined or terminated due to their convictions, claiming that it is not uncommon for employees to “claim” that an employer is unfairly targeting them, and thus employers must be sure to apply policies relating to disclosure fairly and consistently. Not only do many with criminal records face insurmountable barriers to obtaining employment, but they face disparate treatment once they get into the workplace as well. Approximately 90 percent of employers still do criminal record background checks on potential hires, and one in four U.S. adults has an arrest or conviction that would appear in these routine checks. This results in an unfair amount of discrimination in the workplace. 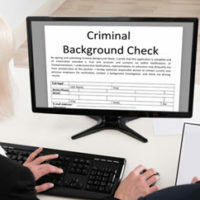 Still, the Commission has yet to provide new or additional guidance as to whether the use of criminal background checks may discriminate against some candidates and employees. Employers can also use what’s known as the “business necessity defense,” whereby the employer has the ability to demonstrate that the policy is related to the ability of the candidate to successfully perform the job. Although you should in no way be judged in your employment based on a mistake that you made years ago, sadly, the reality is that trying to get a job, and maintain trust as an employee, can be negatively affected by having a record. In New York, you have the right to get your record sealed under a variety of circumstances. Contact Levy & Rizzo, LLC, The Clean Slate Attorneys today to find out how we can help.